Video by blogTO's Ryan LaFlamme, who was embedded in the action and took many a pillow in the gut to bring you this inside look at the pillow fighting craze. Newmindspace held their second Toronto pillow fight in Nathan Phillips Square this past Saturday afternoon. As is customary for Facebook event listings, the total number of people who turned out fell a bit short of the number who claimed they would, and I don't think the event managed to bring out the 996 listed on the 'book. The fact that a number of people seemed to think they were supposed to be at Dundas Square contributed to this. All the same, those who found themselves in the middle of the several-hundred-person pit being assaulted by pillows from every direction probably felt that there were more than enough opponents present, and the attendance did beat 2005. Anyone who stood out amongst the horde for any reason wound up receiving more than their share of whackings. Spiderman, Superman (also), the Green M&M, the two guys with targets painted on their chests, and anyone else who donned a costume, screamed out something ridiculous or dared to be Kevin Bracken or Lori Kufner would receive a barrage of pillows their way. No one got that message beaten into them better than the guy with the orange pillow in the photo up top. He was propped up on a friend's shoulders and the two repeatedly charged into the pit, trying to make it all the way through from one side to the other while screaming and swinging. This particular photo is from their first attempt, which I witnessed from the outskirts. 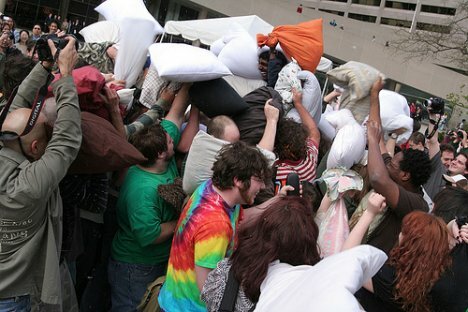 As soon as they neared the middle, every pillow (and every camera) in the place took aim at them and fired like crazy. I saw them do this a few times, and as far as I know they made it through each time. Another pair who tried didn't fare quite so well, and were beaten back and then forced to the ground after making it about a third of the way in. Pillows started bursting and feathers flying fairly early into the hour and a half long battle, and by the end there was a thick layer of feathers and fluff covering the area. A team of Newmindspace supporter-volunteers worked to clean it all up, and though they may have not contributed the most towards the cleanup, the numerous birds who were hopping around collecting feathers for their nests put in a heartfelt and heartwarming effort. I wish I'd brought a camera myself, because I'm not sure if any photogs noticed this little phenomenon taking place on the distant outskirts of the Square. By the way, I myself was dressed like this (though I was using a white pillow rather than that pink one for most of it), in case any of you recall getting into any duels with me throughout the battle. There are a sackful of great photos from this event (this aftermath shot being my personal favourite), plus one video that I've seen so far and most likely many more to come. Check the Newmindspace event's listings for photos, and videos as they emerge, and if you've uploaded your own media, drop them a line.